Packaging Size 25 kg HDPE bag with liner / 50 kg HMHDPE drum with liner. Packaging Type 25 kg HDPE bag with liner / 50 kg HM HDPE drum with liner. 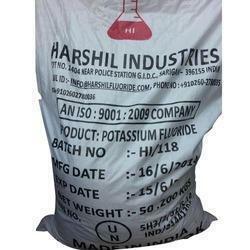 Potassium fluoride (KF) is the chemical compound with the formula KF. After hydrogen fluoride, Potassium Fluoride (KF) is the primary source of the fluoride ion for applications in manufacturing and in chemistry. Potassium Fluoride (KF) is an alkali halide and occurs naturally as the rare mineral carobbiite. Solutions of Potassium Fluoride (KF) will etch glass due to the formation of soluble fluorosilicates, although HF is more effective. Potassium Fluoride (KF) is our main and Key product! As the development of new pharmaceuticals, pesticides and dye stuffs, some of which contain fluorine, high active anhydrous potassium fluoride (KF) is becoming more and more important. In organic chemistry, Potassium Fluoride (KF) can be used for the conversion of chlorocarbons into fluorocarbons, via the Finkelstein reaction. Such reactions usually employ polar solvents such as dimethyl formamide, ethylene glycol, and dimethyl sulfoxide. The fact that the quality of the product is better than all the same kind of products is proved by the authoritative examination and customers. Flux for Solder and insecticide formulation. 50 kg HMHDPE drum with liner. Packaging Details 25 kg HDPE bag with liner / 50 kg HMHDPE drum with liner.